Chlorophyll is an essential part of the process of photosynthesis. It absorbs solar energy in order to provide power for the process of photosynthesis. Because it absorbs energy, it has an important effect on the amount of energy that is reflected (see here how light interacts with vegetation). With remote sensing we can directly estimate how much chlorophyll there is in a plant. By combining more than one bands of the recorded remote sensing data, we can create vegetation indices and use them to estimate crop status. 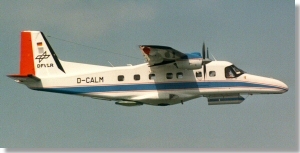 The Dornier Do228-101 D-CALM aircraft operated by the German Aerospace Centre (DLR). Using vegetation indices we can manipulate the remote sensing data and produce classifications (click here for more information on image classification) that show us the plants under stress. The classification appearing on the next image, used data captured by the Airborne Visible/Infrared Imaging Spectrometer (AVIRIS) sensor, which was mounted on an aircraft. 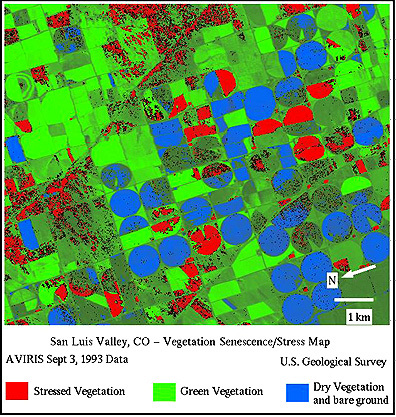 Identification of stressed vegetation from AVIRIS data. Depending on the visible and near-infrared reflectance, the produced vegetation indices give us an indication on the amount of chlorophyll present in the plants. With this information we can estimate if and how much stress the plants are under. In the classified image above, the fields that appear blue are without vegetation (bare soil) and those that are green are covered with vegetation. Parts of the fields that appear red, indicate plants under stress.